I’m 40 years old today. I’ve heard I’m supposed to lament over this. But I don’t feel like wailing. I was remembering that in the 28 years I knew my great-grandmother, she rejoiced in every birthday as a personal achievement. In fact, in my memory, neither her, nor my grandmother, nor my mother ever mourned over getting older. Birthdays were a day to be celebrated. And why not? I mean, I have indeed noticed a few changes to my body in recent years. I have more grey hairs. I have more wrinkles. My skin is getting saggier in places. But I have another year under my belt, and that’s awesome! Because the truly good news is that with each passing year, I’m being transformed. Sure, I’m changing physically, but I’m also changing emotionally, mentally, and spiritually. With every passing year, I learn new things and after 40 years, that really adds up. I’ve learned a lot of things about myself over the years. Things that have been both enlightening and humbling. I’ve learned I like change. I love it, actually. But I also like routine. Yes, I’m a confusing paradox. I’ve learned I can’t control everything. I cannot plan my way to stability. I do not know the future. I’ve learned that I’m a people-pleaser and I like to be well thought of. And along with that, I’ve learned that seeking the approval of people is both futile and debilitating. I’ve learned things about others in my four decades of living. I’ve learned that making an effort for people is always worth it. I’ve learned that being dependent on people once in a while is not the end of the world. That everyone is imperfect, but still worthy of love. I’ve learned things about God after 25 years of knowing him. I’ve learned that He is faithful and good. That he brings peace to the human heart. That his Spirit speaks. That his goal is not to make me comfortable, but to make me more like Jesus. I learned things about life. I’ve learned that the best decisions we make are based on faith, not fear. That owning less is actually liberating. That we should never say “never” because real life experience has a way of changing our opinions. I’ve also learned that life is full of unexpected turns and it’s best to lean into them and enjoy the ride. These are the kinds of lessons you can’t hand to a young person on a silver platter. You can’t just list these life lessons for a teenager and be done with it. We’re wired to grasp lessons more fully through trial and error. These lessons are earned with the passage of time and the gift of experience. The pains and joys of life teach us. The regrets and achievements change us. The losses and the pleasures shape us. I would hope that someone who met me 20 years ago would still recognize me today. I don’t think my physical transformation has been that drastic yet. But in many other ways, I hope I am unrecognizable from my 20 year old self. I’d never want to go back. You couldn’t pay me enough to go back to my 20 year old self, my 30 year old self, or even my 39 year old self. Every single year of life experience is priceless to me. I’m so glad to be 40. Imagine the ways God will refine and transform me between now and my 50th birthday! Cheers to that! 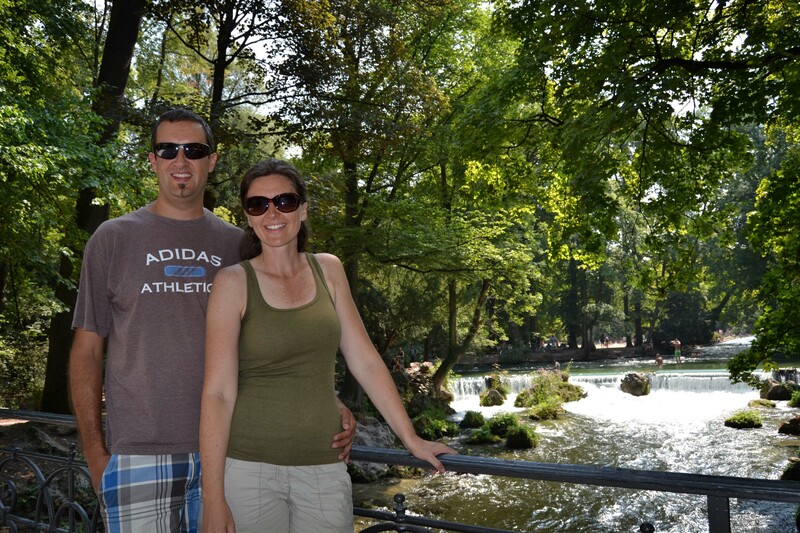 This entry was posted in Living On Mission, Processing Life and tagged Turning 40. I’m staring at a door. A closed door. What’s behind that door, you might wonder? It’s my future. I picture that door leading me into next month. There are a few things I know about what’s behind this first door. I know I’ll be in Al Ain. I know I’m homeschooling in there. 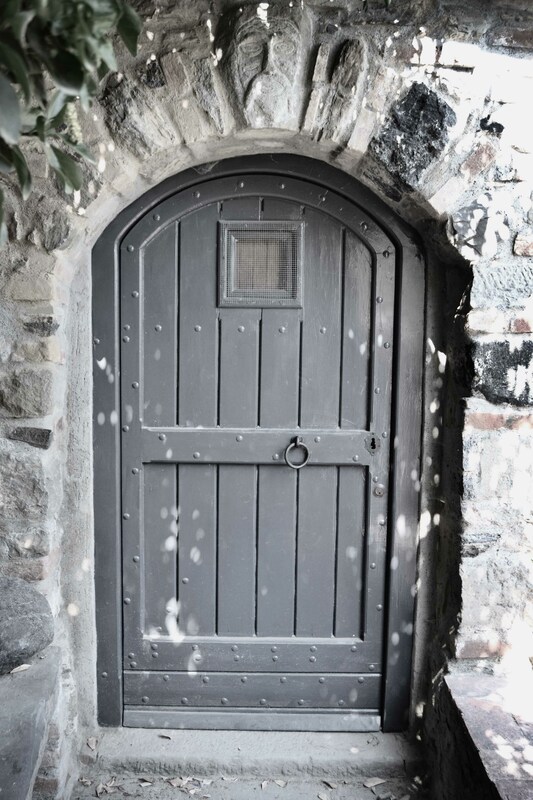 I know where we go to church and the great loves who will visit us behind that door. I know Josiah’s birthday is there and I know about a handful of activities we have planned. And from that room there will be another door to November. I know we’re still in Al Ain behind that door too. I know where we go to church and that we’re homeschooling. I know the great loves who are coming to visit us behind that door too. I know less about our activities, but I’m sure it will be similar to the October room. And there will be another door to December. Some of the same stuff will happen in there. And we will fly to Thailand behind that door. And celebrate Christmas somehow. And then there will be another door to 2016. I have some vague ideas about what’s behind the first half of those rooms. Al Ain, homeschool, church, work, some travel, some activities. But it starts to get fuzzy. I can’t see that far. And the BIG question is: Where do the doors lead for the last half of the 2016 rooms? What will be behind those doors? I can’t say. I wish I could. I’m dying to know. But I’m not the architect with an overhead view of the whole building. I didn’t create the rooms. I can’t possibly know how each room will look or where the outgoing doors will appear. I don’t know what will happen in those rooms to affect our future door-choosing activities. I don’t know which doors will be unlocked and which doors we will feel compelled to walk through or walk by. I don’t know where the Holy Spirit will whisper and rustle. It’s not for me to know. We weren’t meant to see it all at once. God has things to do in me first. If I don’t allow him to shape me and transform me, I won’t be ready for the doors ahead or what’s behind them. Because that’s actually the purpose of walking through these doors and rooms: life change. Becoming more like Jesus. Seeing more of God revealed so I can reveal him to others. It’s not about the specific path I take through the maze of doors, but about who I become while I’m walking. About who God is above it all, in it all, and through it all. He is the Creator of all the doors, all the rooms, all the people and experiences in those rooms. He’s the Master Designer and his Spirit leads me. So it really doesn’t matter what is in those rooms or where they lead because I trust in his goodness, his sovereignty, his wisdom, and his love for me. So I will wait expectantly and with great faith open each door, one at a time. We ended our first European adventure with 5 nights in Germany. 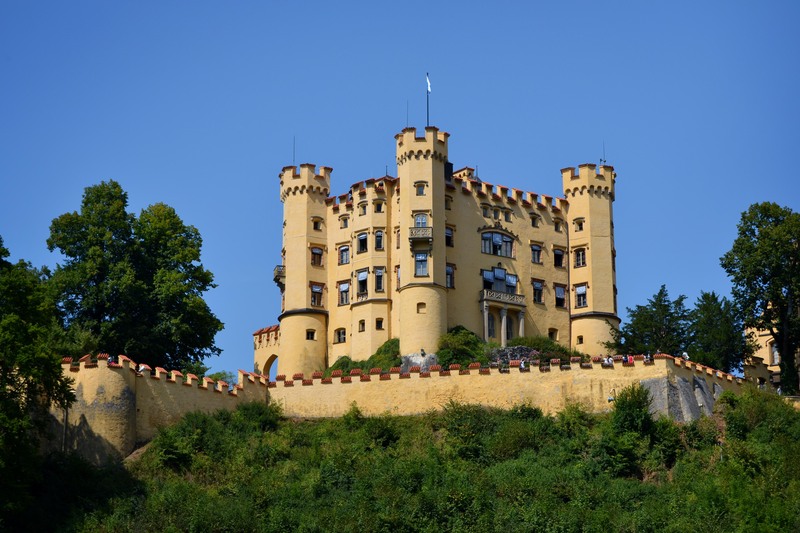 Though we were initially looking to stay in Munich, we soon discovered that accommodation there was also a bit out of our price range, so we moved our search to nearby Augsburg. I was telling Mel about our trip planning progress and she reminded me that she has a good friend who lives in Augsburg. To make a long story short, we connected and made arrangements for our family to use her lovely home while they were away on holidays. Though we stayed in apartments instead of hotels all summer, there was something exceptionally welcoming about coming to an actual lived-in family home after a month of traveling. Lots of toys, a fully stocked kitchen, board games, and even family bikes. In a way, it felt like we slipped back into our Unity Drive life for 5 short days. 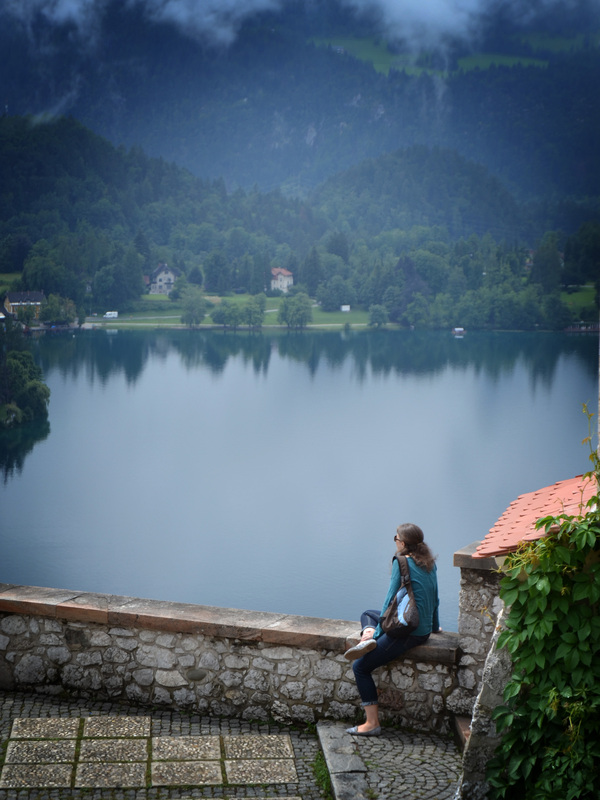 As we packed up to leave our beautiful Augsburg home I was full of conflicting emotions. I was disappointed that our vacation was coming to a close. It felt hard to imagine returning to real life routines and making our own dinners. I was nostalgic for Canada, BC, Chilliwack, and specifically, our house, which is no longer our house. I was tired. Five weeks is a long time away from my own space and personal things, but it’s also a long stretch full of daily activities. Which meant that mostly, I felt ready to go home. And home for me meant our little apartment in our little desert city in our little middle eastern country. It’s pretty great how our hearts find ways to plant themselves, even in very arid soil. 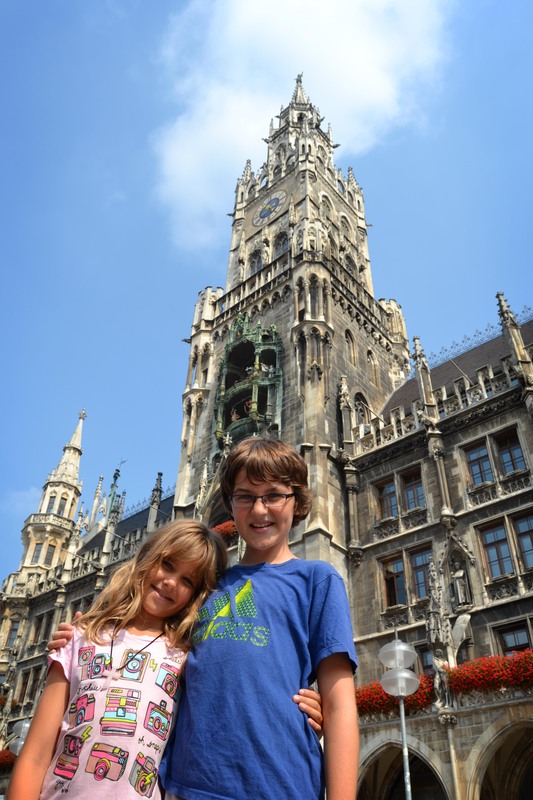 J & A in Marienplatz, Munich. Walking around the English Gardens. Next time we’ll bring out bathing suits because diving into this river looked incredibly refreshing. 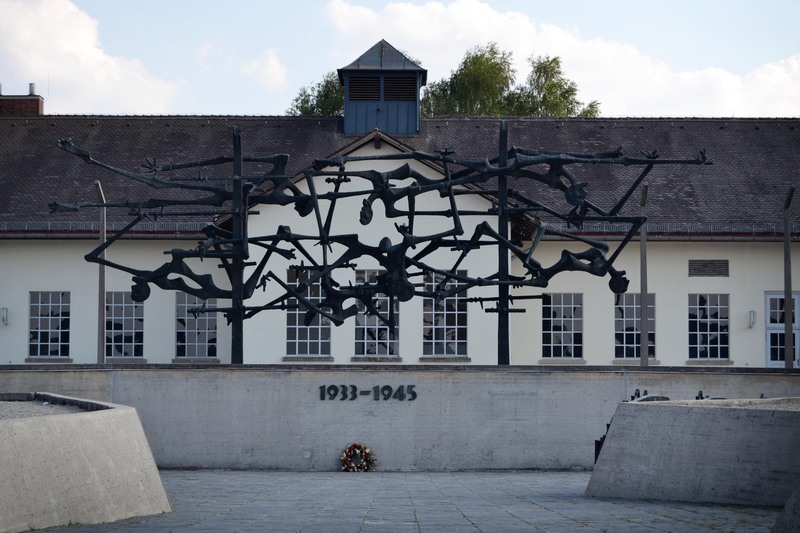 At the Dachau concentration camp memorial site. No words. 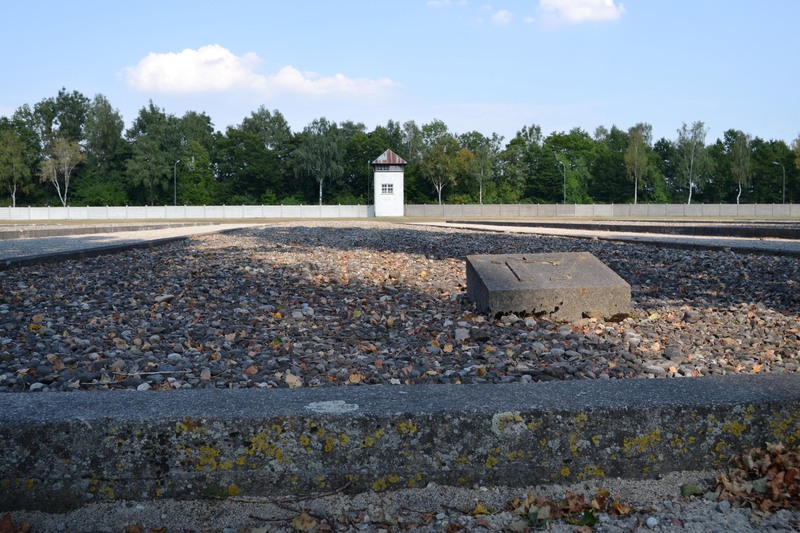 Former site of one of the dozens of prisoner barracks. 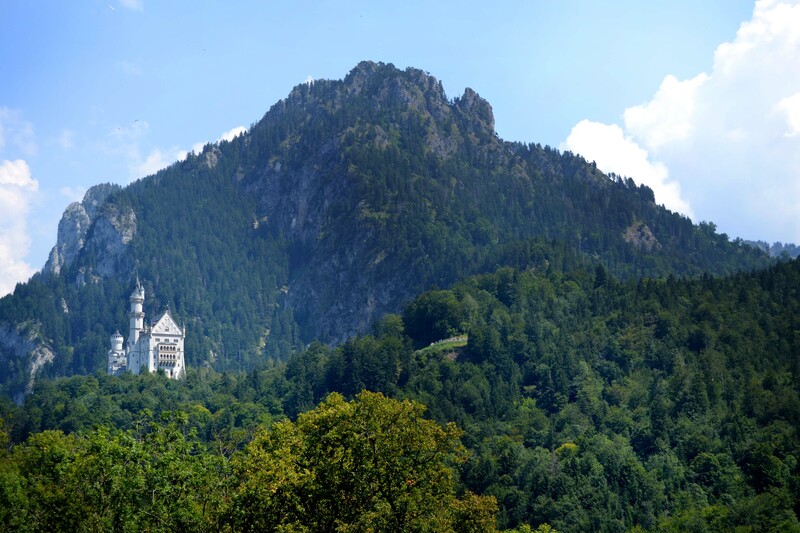 This is the castle where Ludwig II’s family spent their summers. He built his fairy tale castle just up the mountain. And what a build it was! This was one of the most spectacular vistas I’d ever looked upon. The Turkish restaurant by our place in Augsburg had better food than any restaurant we visited in Turkey. 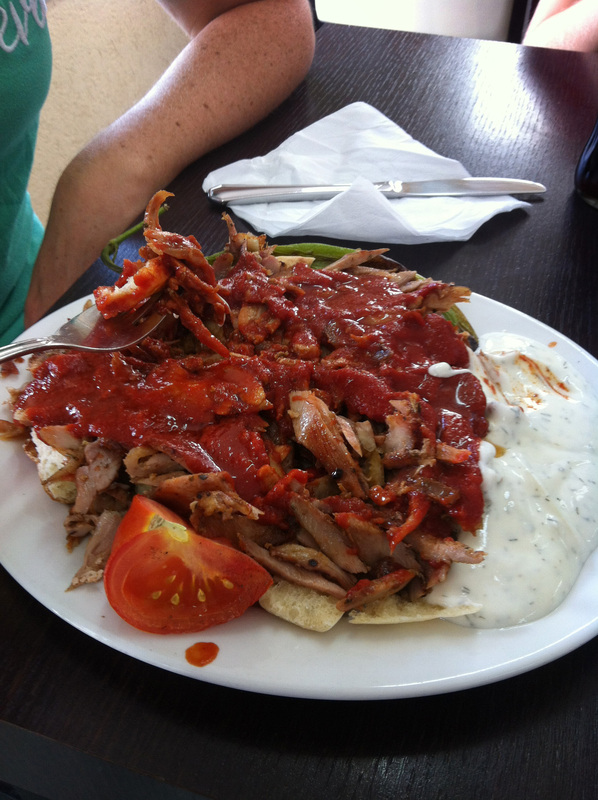 I could eat this Iskender every week. Back in the airport after a summer of trains and buses. We took a short flight from Munich to Rome where we connected the next morning to Abu Dhabi. These two have become super skilled at navigating airports, train stations, bus stations, and ferry stations. This truly was a trip of a lifetime. So many visions and dreams turned into reality. Gratitude. I’m all full. 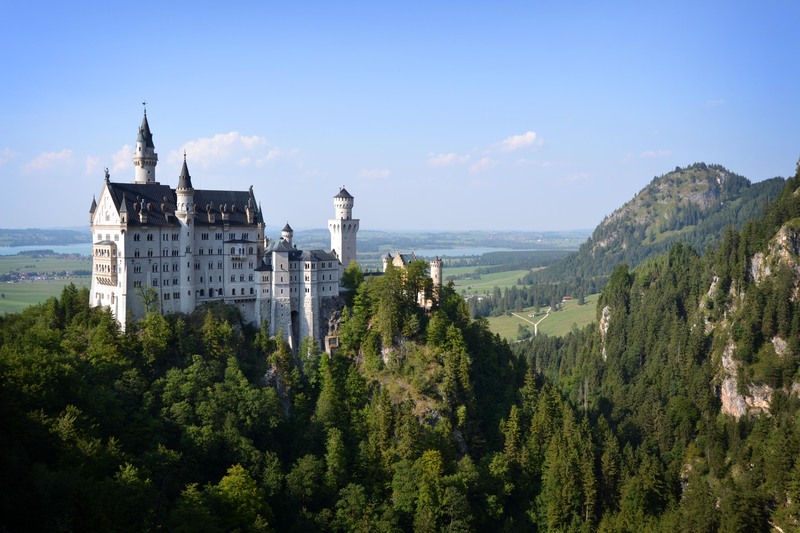 This entry was posted in Travel Log and tagged Dachau, Ludwig II, Marienplatz, Munich, Neuschwanstein Castle.